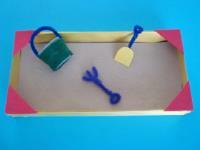 A sandbox that figurines can play in all summer long. 1. Gather your material. 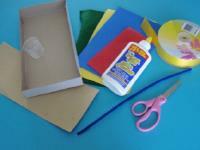 You will need the bottom of a cardboard box or tray, a piece of sandpaper, colourful Fun Foam, felt, a pipe cleaner, scissors, a small plastic dosing cup, white glue and/or hot glue, and ribbon. 2. 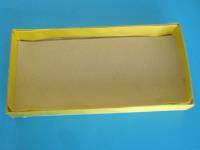 Glue the ribbon along the inner and outer edges of the box as shown. 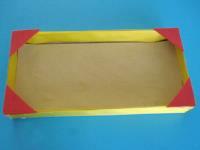 Cut the sandpaper so it fits inside the box and glue it in place. 3. Cut four triangles out of a piece of Fun Foam and glue them in each corner of your miniature sandbox as shown to represent benches. 4. 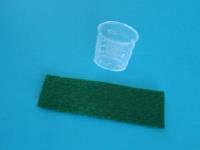 Cut a rectangular piece of felt so it has the same height as the dosing cup. 5. 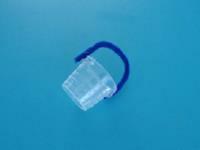 Cut a pipe cleaner piece and glue it on either side of the dosing cup to represent a handle for what will become a bucket. 6. Wrap the felt around the dosing cup and glue it in place. 7. 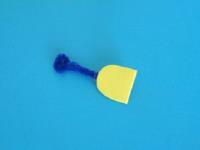 Cut a small shape representing the tip of a shovel out of another piece of Fun Foam. 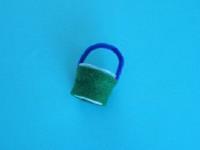 Attach a small pipe cleaner piece to it to form a handle. 8. 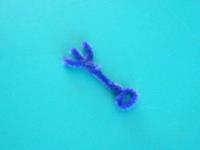 With the remaining pipe cleaner piece, form a small rake. 9. Position your miniature sand toys inside the sandbox and it's ready to welcome its first visitors (figurines)!